Winter is approaching, the days are getting shorter, and the air is swiftly becoming ever more chill and damp. Well, for you, perhaps. Down here in Australia, things are a little different, and we’re more likely to need sunblock and siestas than woolly hats over the next few months. Still, I always endeavour to empathise with my readers, so following on from our recent visit to Finland, this week will see another couple of posts from rather cooler climes, starting today with a trip to Iceland. Join me on a literary trip to the north, where we’ll encounter a whole host of writers, and even take a boat trip or two. Brrr – I’m feeling colder already. Perhaps it is because philosophy reached these shores comparatively late that Icelandic writers have never felt bound by the truth. While recognizing no literature except that which springs from reality, they reserve the right to distort the truth according to the demands of their tales. And the same, naturally, applies to all that has been written above. Initially, you could be forgiven for wondering where the Icelandic stories actually are, with several of the early pieces set overseas. Auður Jónsdóttir’s ‘Self-Portrait’ (tr. Lytton Smith) recounts a woman’s experiences while on holiday in Sardinia while Gerður Kristný’s ‘Escape for Men’ (tr. Sola Bjarnadóttir O’Connell) looks at a young woman’s unexpected freedom during her stay in France. Meanwhile, Rúnar Vignisson puts a different spin on things in ‘Travel Companion’ (tr. Julian M. D’Arcy) as we are told about a hiking and camping holiday by the person left behind. He was feeling queasy: seasickness was starting to rear its ugly head. he continued making meatballs; he had to make a heap of them for eight men, or seven anyway – he himself wouldn’t eat much now. And then the gushing started. The new cook vomited heartily over the meat mixture. He wiped his mouth on his apron and thought that now it was do or die. Talk about a rite of passage! He scrutinizes us all. I know he’s reading our auras, and since he’s paying so much attention to us going to church, someone, according to old legends, is doomed. Stefánsson is far from the only familiar name you’ll find in the collection. ‘Afternoon by the Pacific Ocean’ (tr. Bjarnadóttir O’Connell) is the contribution of Kristín Ómarsdóttir (Children in Reindeer Woods), a brief sketch of Marilyn Monroe and Greta Garbo enjoying bread rolls, Ulysses and Egil’s Saga – as you do. There’s also a short piece by Auður Ava Ólafsdóttir (The Greenhouse, Butterflies in November) called ‘SMS from Catalonia’ (tr. Brian FitzGibbon), a micro-story in which love is expressed through inventive text-message descriptions of a football match. 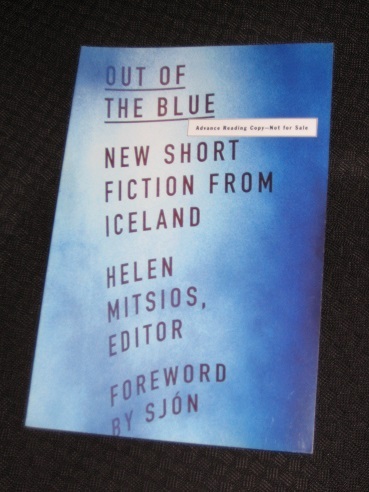 Out of the Blue reminds me a little of the excellent Comma Press city-themed collections, so it was a happy coincidence to find two writers they’ve published included here, both with new stories. Águst Borgþór Sverrison’s ‘Laundry Day’ (tr. Matich) is typical of the contemporary family dramas in Twice in a Lifetime, but my preference is for ‘The Black Dog’ (tr. Bjarnadóttir O’Connell), another story from the excellent Gyrðir Eliasson (Stone Tree). It’s a short, creepy story of a man staying at a remote hotel with only his own demons for company, and the beauty lies in the way the writer evokes a threatening mood without needing to actually introduce any strange occurrences.